Welcome to tutorial 44 in this series of tutorials designed to help you learn EasyLanguage coding skills. EasyLanguage is a programming language that was developed for the TradeStation trading platform that can be used to write programs to help in the technical analysis and trading of foreign exchange (forex or FX), commodities (e.g. the Dow e-mini, S&P e-mini etc), options, and stocks. The program created in this tutorial (and an example TradeStation workspace) are available for immediate download for $24.95. 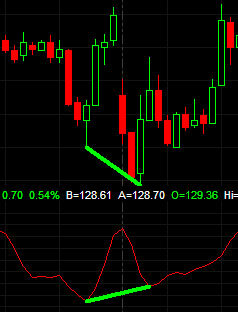 In tutorial 26 I created an indicator that looked for divergence between price and a stochastic indicator. If divergence occurred a lines was drawn between the pivots in the price action on the main chart. Tutorial 26 recognized that the pivot points in price may not occur on the same bar as the pivot points occur on the stochastic. This tutorial uses the base code developed in tutorial 26 to show how it is possible to draw lines on the sub graph. To do this we need to modify the program slightly and follow a number of simple steps outlined in the video below.